RAVENOL ATF 5/4 HP Fluid is a fully synthetic ATF produced on the basis of PAO with a special additivation and inhibition which guarantees a perfect function of the automatic transmission. RAVENOL's innovative ATF product line has out performed many of the leading companies that produce automatic transmission Fluid. RAVENOL has been awarded formal approvals from leading transmission manufacturers including ZF. RAVENOL 5/4 HP fully synthetic Automatic transmission fluid provides superior OEM protection that reduces friction and provides maximum power transfer with smooth consistent shifting in all driving conditions. Using RAVENOL 5/4 HP automatic transmission fluid in your vehicle results in improved transmission efficiency and optimal fuel economy. RAVENOL 5/4 ATF Fluid matches the original OE factory (ZF) fluid color which was neutral brown (Tan). 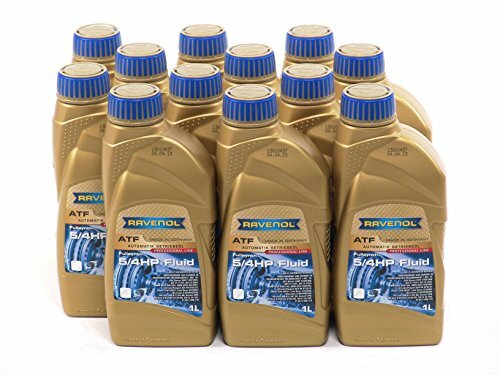 RAVENOL ATF 5/4 HP Fluid is suitable for use in ZF automatic transmission of ZF Series 4 HP (4HP20, 4HP22, 4HP24) and 5HP (5HP18, 5HP19, 5HP24, 5HP30).